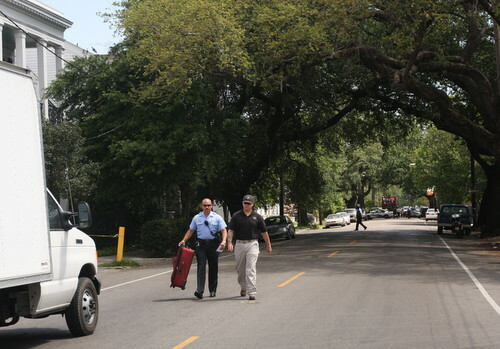 A suitcase left unattended on a Magazine Street sidewalk through the Garden District and Irish Channel caused a bomb scare that closed the street briefly on Monday morning, authorities said. A police officer was flagged down about the unattended luggage in the 2700 block of Magazine (between Washington and Fourth) shortly before 11 a.m. Authorities stopped traffic on the street at both ends of the block while the NOPD bomb squad arrived. After a brief investigation, the suitcase was determined to be empty, and Magazine reopened around 11:30 a.m.
Several busy streets have been closed around New Orleans for similar false alarms over the past week following the Boston Marathon bombings, but local police have repeatedly said they welcome the information and residents’ heightened sensitivities. come on folks lets not lose our heads here! Keep calm and laissez le bon temps roule! If you see something… SAY something !! Wise to check anything suspicious; to the person that flagged down the police.. Thank you. Glad to see people are finally starting to notice all the random trash lying around the city. I literally kicked this suitcase while my son and I were admiring the old pickup as he walked to work. The bomb possibility never crossed my mind.